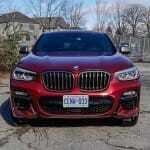 BMW has vastly expanded their line up over the past decade. 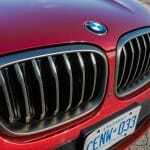 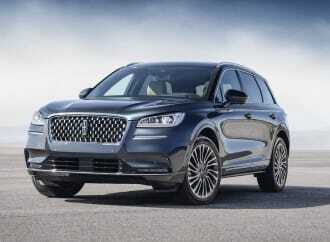 This includes several ground-breaking models creating segments new to the auto industry. 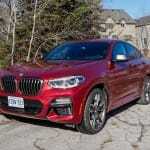 The BMW 640i Gran Turismo (reviewed here) and the X6 are two such examples. 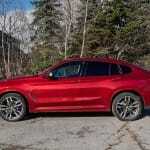 While the Gran Turismo and the Sports Activity Coupe models enjoy varying amounts of success, BMW saw the opportunity to bring in smaller examples with the 3-series Gran Turismo and the X4 models. 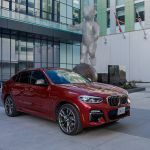 The X4 has been particularly successful and BMW has now launched the second generation model. The 2019 BMW X4 M40i xDrive arrived in our office painted in a gorgeous Flamenco Red Metallic. 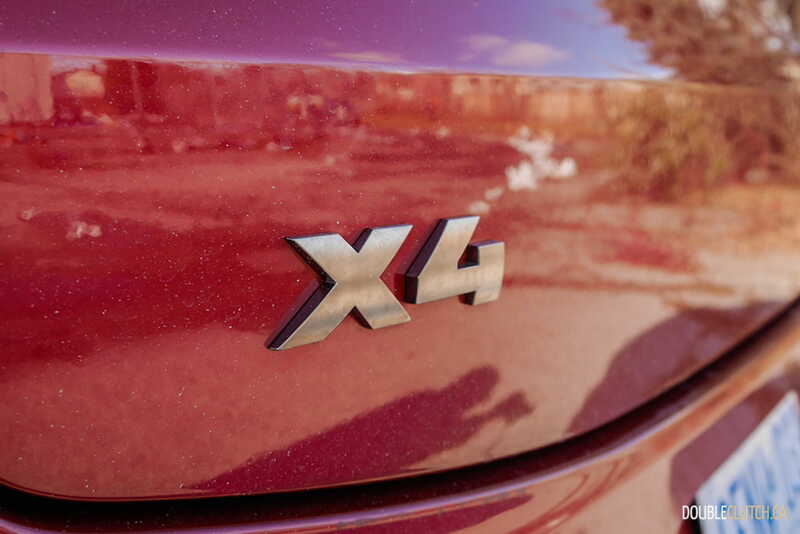 In its natural habitat, the urban jungle, the X4 stands out like a beacon in the night. 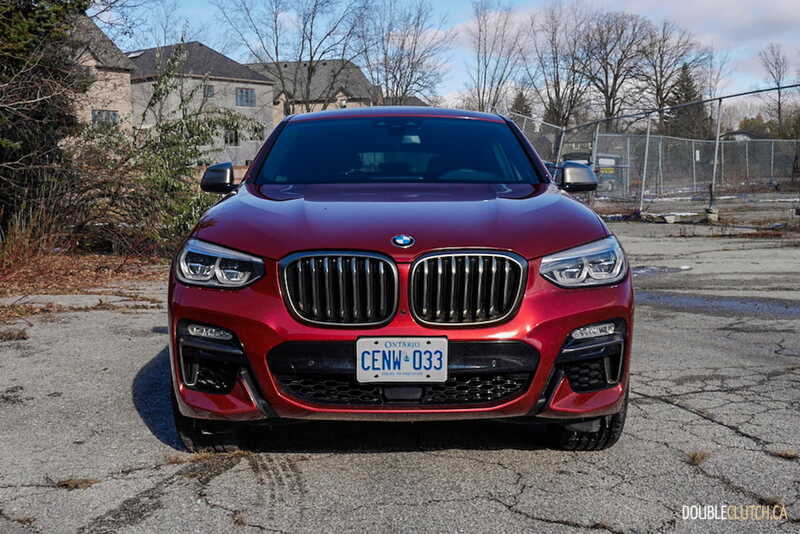 The front end features the classic BMW kidney grilles, twin LED headlights, and LED fog lights sitting over the chiseled front bumper. The M40i comes standard with the M Aerodynamics package with front apron, side skirts, and distinguishes itself with its side windows painted in a satin aluminum finish. 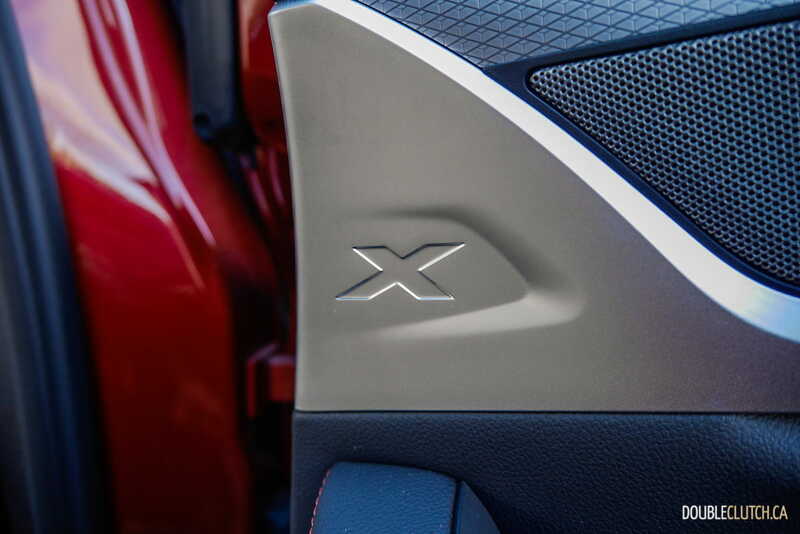 The second-generation X4 is 81mm longer, 37mm wider, and 3mm lower than the previous model; an effort to create an athletic stance that did not go unnoticed. 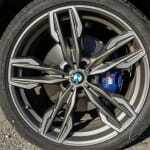 The standard 21” wheels have become some of my favourite wheels in the industry. 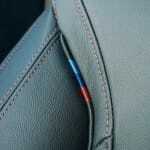 They feature a two-tone satin finish to echo the accents on the car. 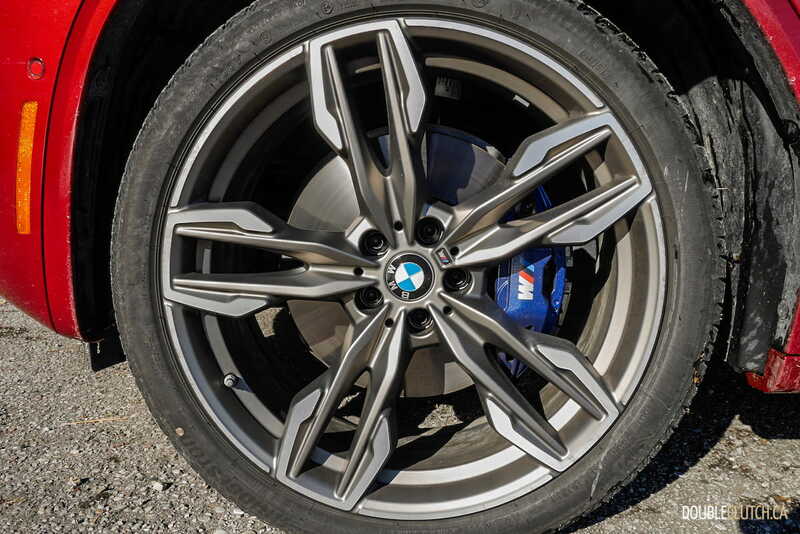 The design of the wheels is brilliant as well; the double spokes are spaced wide enough to allow onlookers a glimpse of the large blue M Sport brakes. 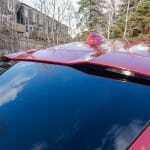 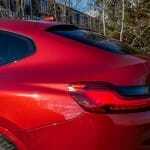 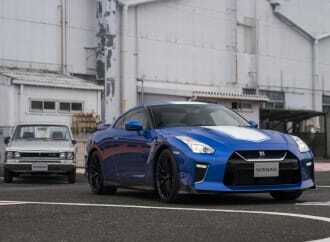 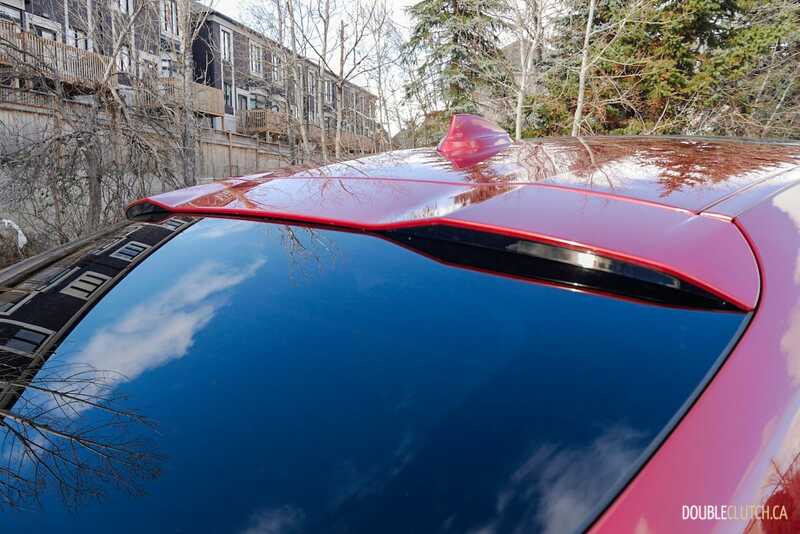 In order to create coupe-like styling, the roofline drops off steeply into the rear past the rear window. 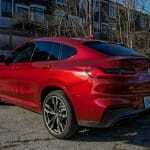 It is a shape that takes some getting used to, but not uncommon nowadays with Mercedes-Benz taking a page out of BMW’s playbook to create their latest GLC and GLE Coupe models. 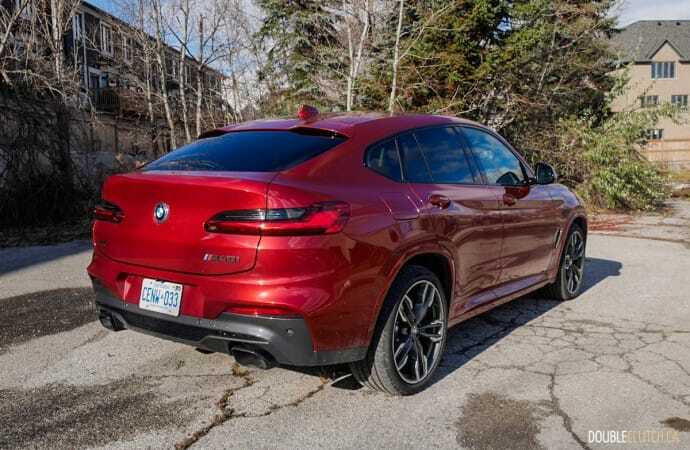 Personally, I think the taillights are too slim for the athletic rear end of the X4 M40i. 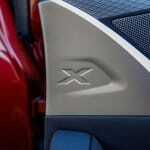 Regardless, this design has never been one within the box. 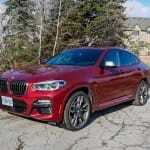 There are few models in the industry that embrace controversy as well as the BMW X4 and X6. 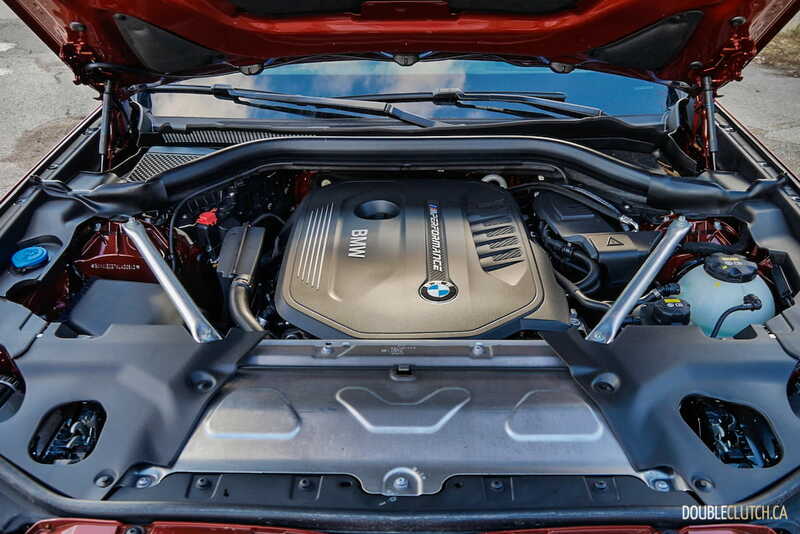 While the exterior of the X4 is controversial, the powertrain on this model is anything but. 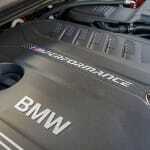 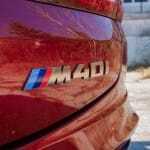 The M40i comes standard with a 3.0L turbocharged inline six (codenamed B58). 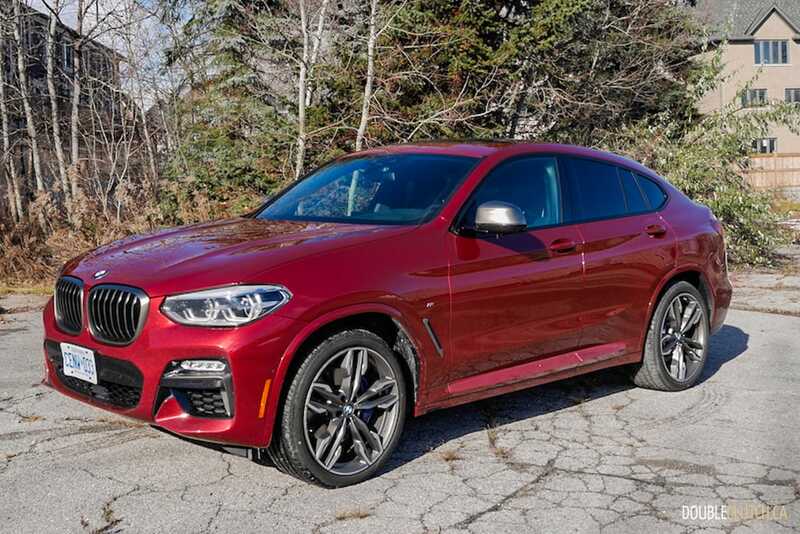 It produces 355 horsepower and sends 365 lb-ft. of torque to all four wheels using an eight-speed Steptronic Sport transmission. 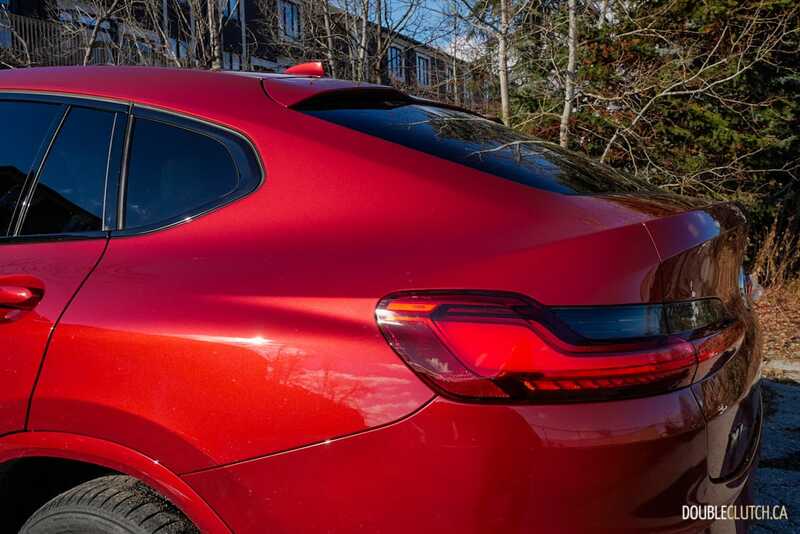 The xDrive system favours sending power to the rear wheels, allowing a fair bit of oversteer if you dare to switch off the Dynamic Stability Control system. 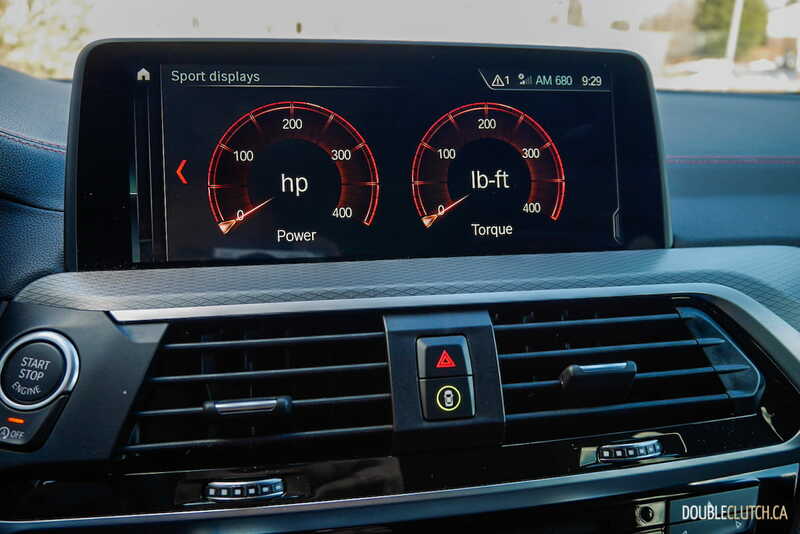 With the help of a standard Launch Control system, BMW claims that 0-100km/h can be achieved in 4.8 seconds, a figure that is faster than many of today’s sports sedans. 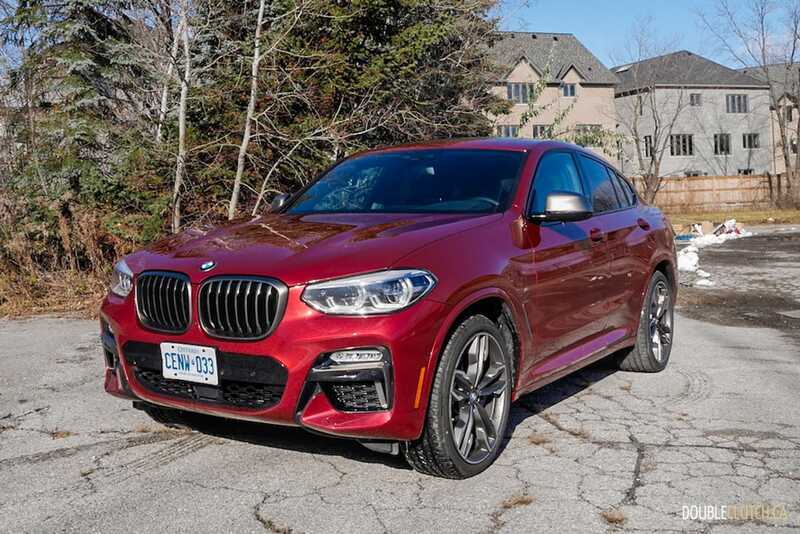 Much like any other vehicles that wear the M Performance name, the driving experience of the X4 M40i is absolute bliss. 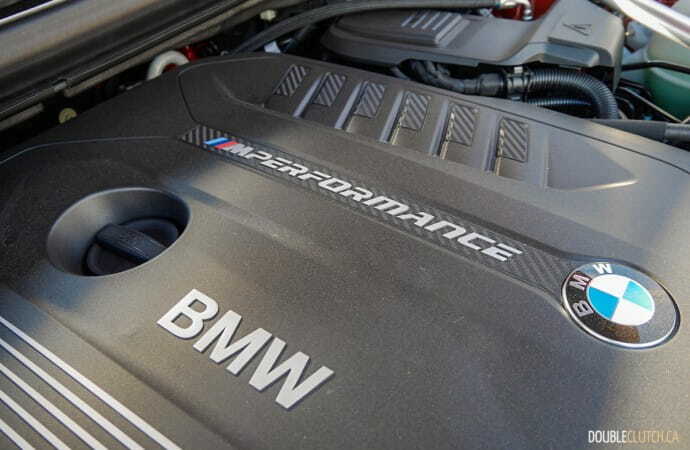 Thanks to the twin-scroll turbo technology, turbo lag is seemingly nonexistent. 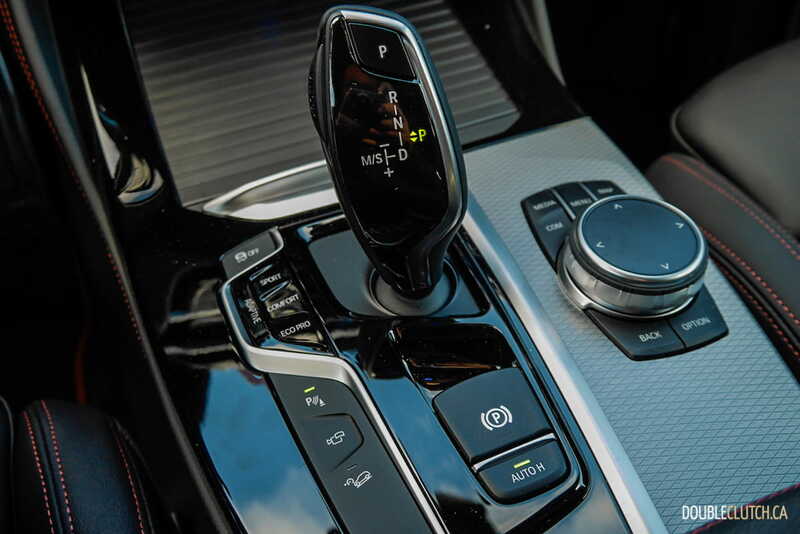 Punch the throttle at any time and the transmission will downshift within milliseconds, thrusting forward the X4 M40i and sticking your back firmly against the seat. The best thing of all is the glorious roar elicited by the B58 powerplant and a deep, rumbling exhaust note from the M performance exhaust system. 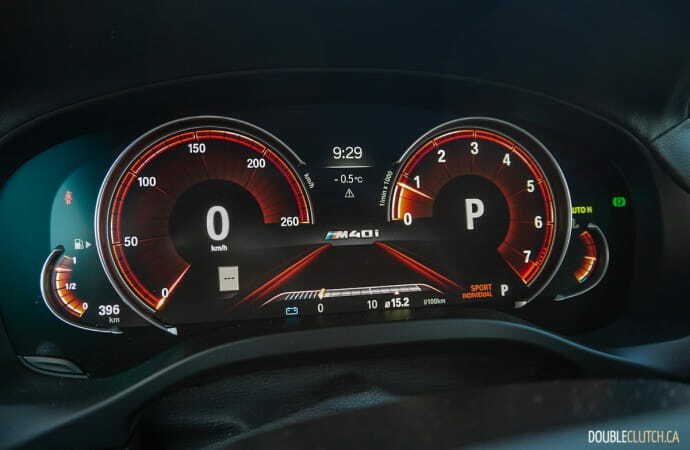 The X4 M40i has four drive modes, ranging from the frugal Eco Pro to the sportiest Sport Plus setting. 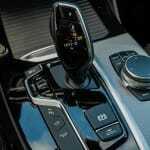 The various driving modes adjust the steering, throttle, transmission, and damper response. 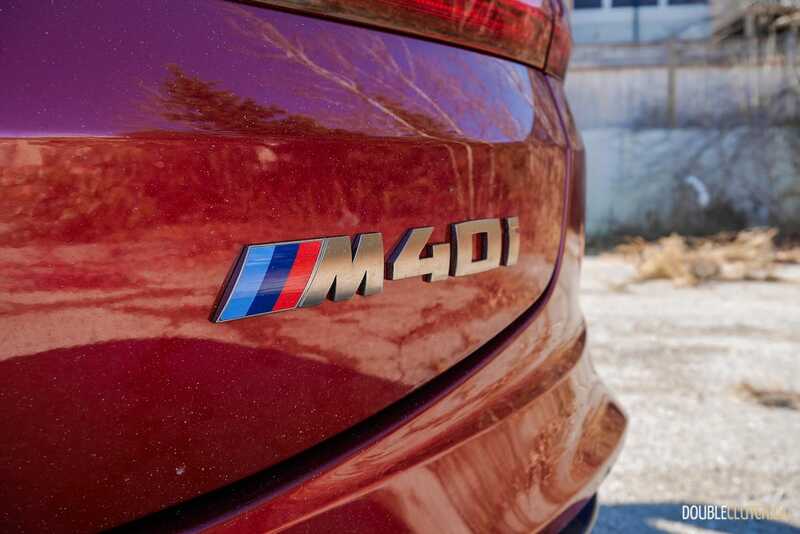 Turning on Sport Plus mode sharpens up the driving experience, and it also opens up the flap-controlled exhaust system which turns the M40i into a rolling firecracker everywhere it goes. 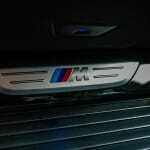 The sound of this exhaust is addictive and one of the best sounding systems out there. 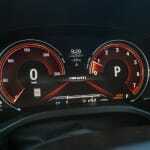 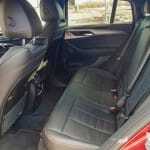 The price for all these sensory indulgence lies within the fuel economy figures. 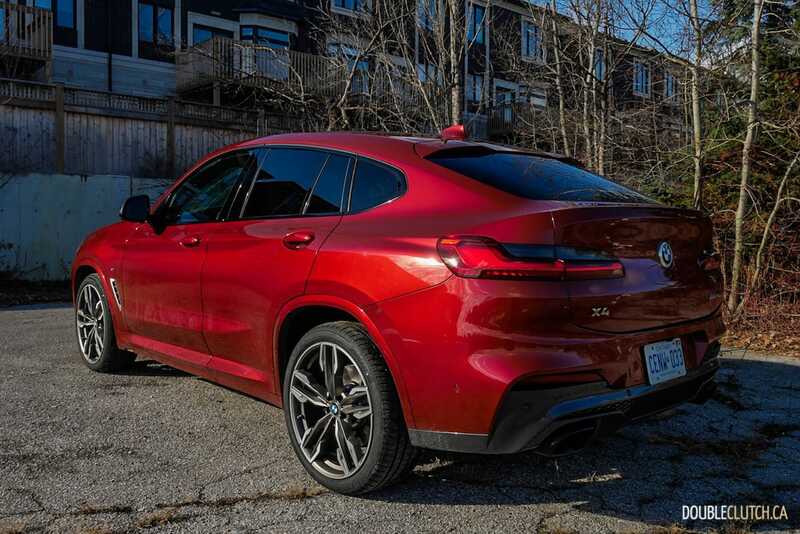 BMW Canada rates the BMW X4 M40i at 11.1L/100km in combined driving. 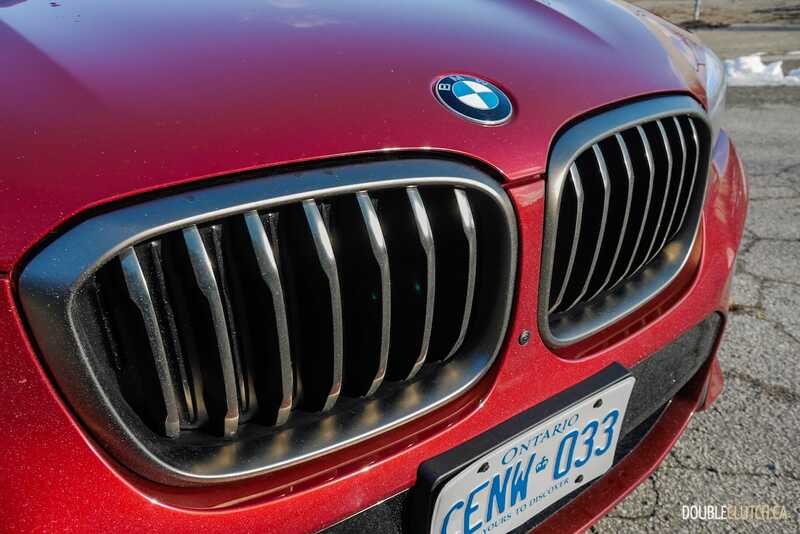 During my week of driving, I observed a much higher 13.5L/100km, which I attribute to cold weather and a largely city commute in bumper-to-bumper traffic. 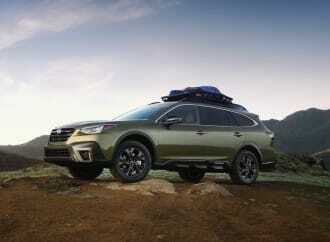 I expect a regression toward the projected estimate over lengthier trips. 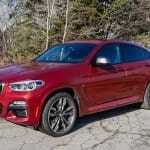 As expected, premium fuel is a requirement for the X4. 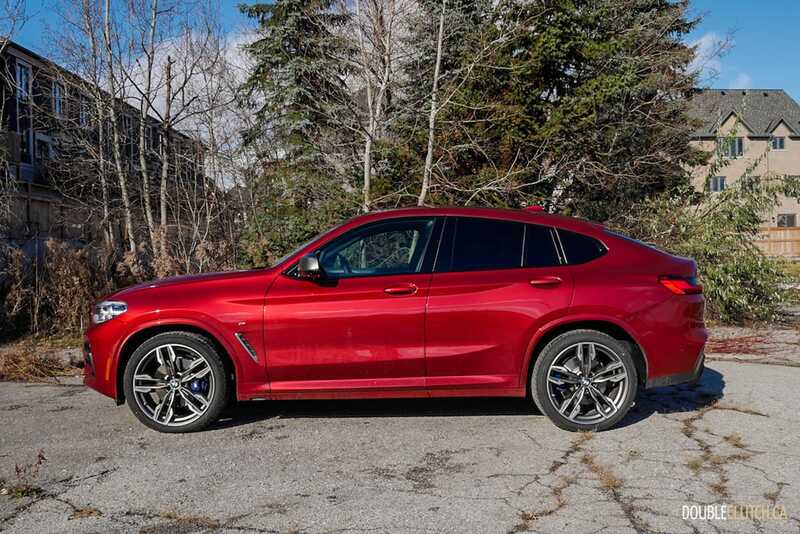 Handling is also a strong suit for the X4 M40i, in typical BMW fashion. 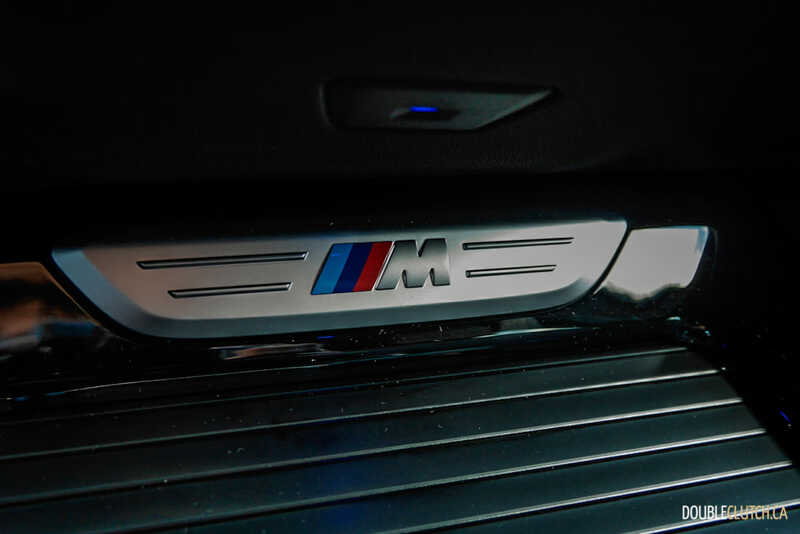 The M Sport differential is excellent in sending power to the correct wheels during cornering to improve agility, and the M Sport suspension keeps the car planted at all times. 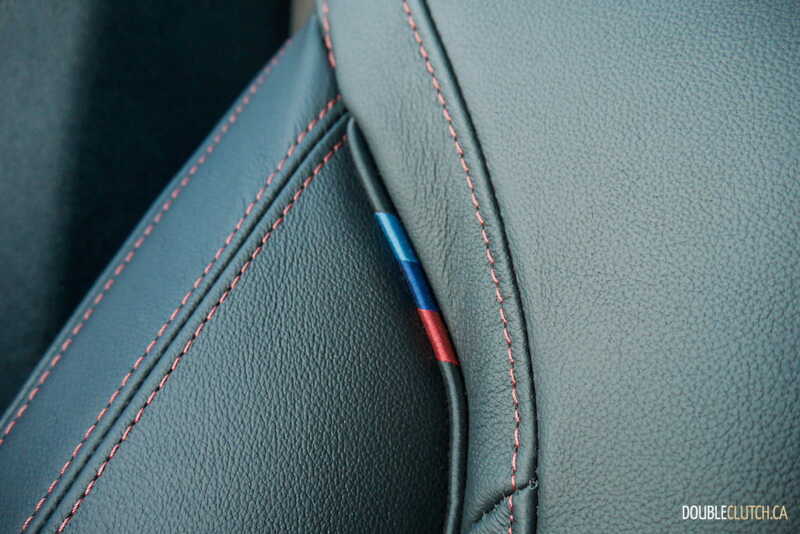 Ride comfort is slightly compromised at the firmest damper setting, but the good news is that damper response can be individually adjusted, allowing for maximum individuality. 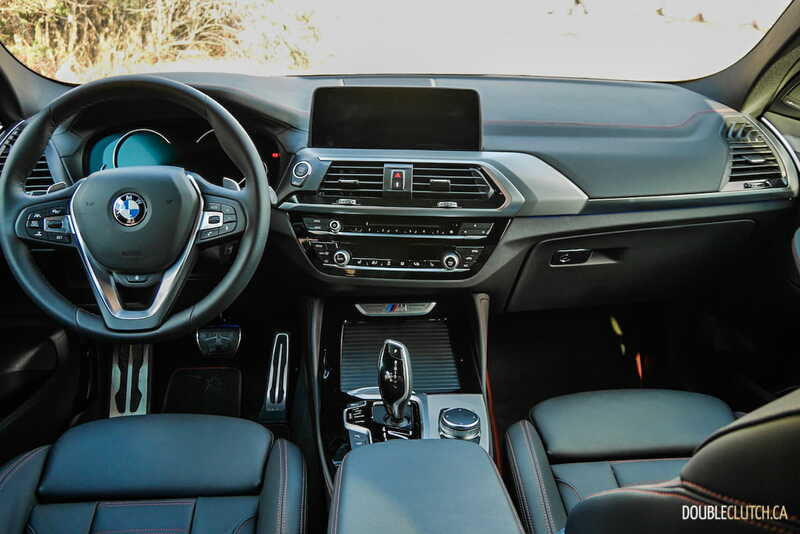 The interior of the X4 M40i features a sporty yet upscale feel. 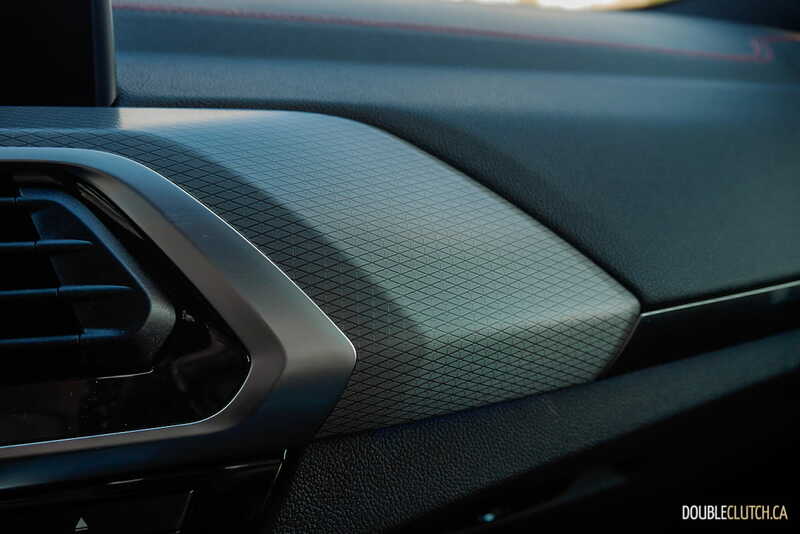 Materials around the cockpit feel premium to the touch, with the Vernasca leather sports seats, Aluminum Rhombicle interior trim, and the M leather steering wheel that is a joy to hold. 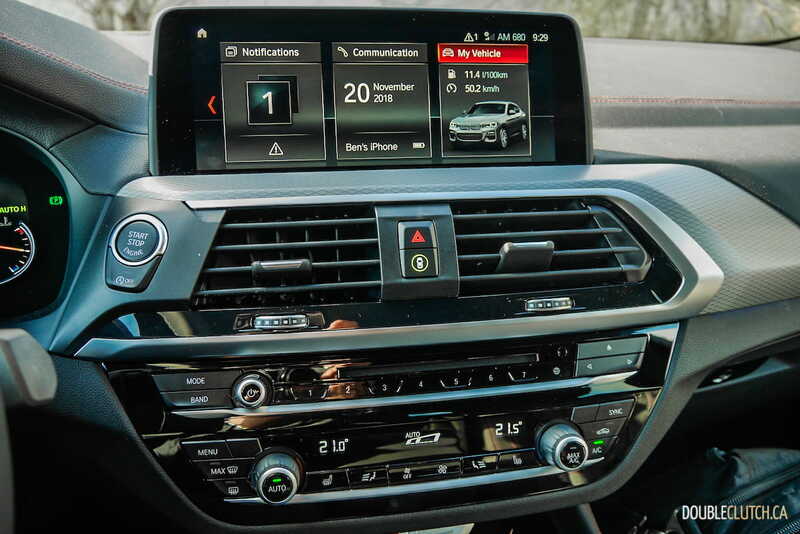 Our tester was equipped with a Premium Package Enhanced option that includes heated seats, ambient lighting, Harman Kardon sound system, BMW Gesture Control, digital display, and head-up display along with many other convenient features. The X4 M40i is fitted with the latest version of the BMW iDrive infotainment system, displaying information using a 10.25” touchscreen that can be controlled by touch, rotary dial, or voice. 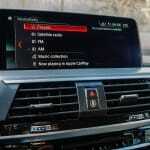 The iDrive system remains one of the most intuitive systems without being overly intrusive. 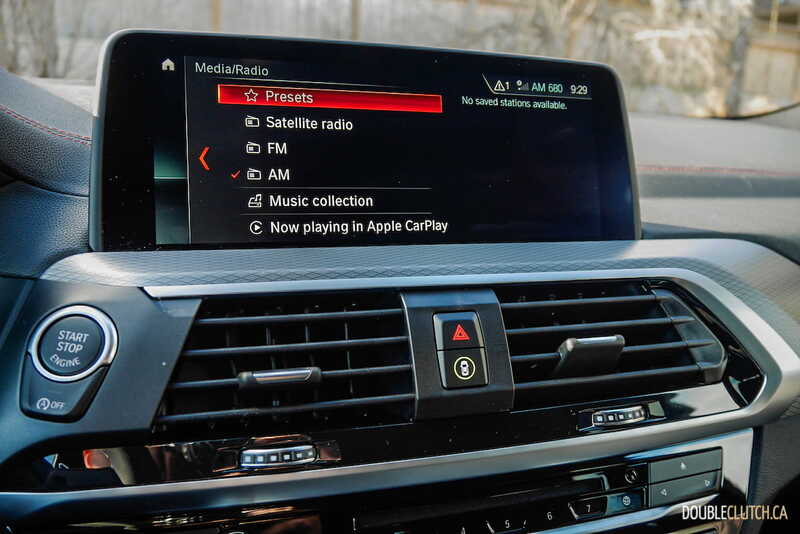 The X4 also comes with Apple CarPlay connectivity, however Android Auto is not available. 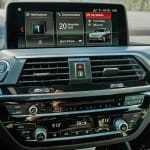 BMW is the first in the industry to offer a wireless Apple CarPlay option, a feature that is not free but is worthwhile, especially for those who hate clutter. 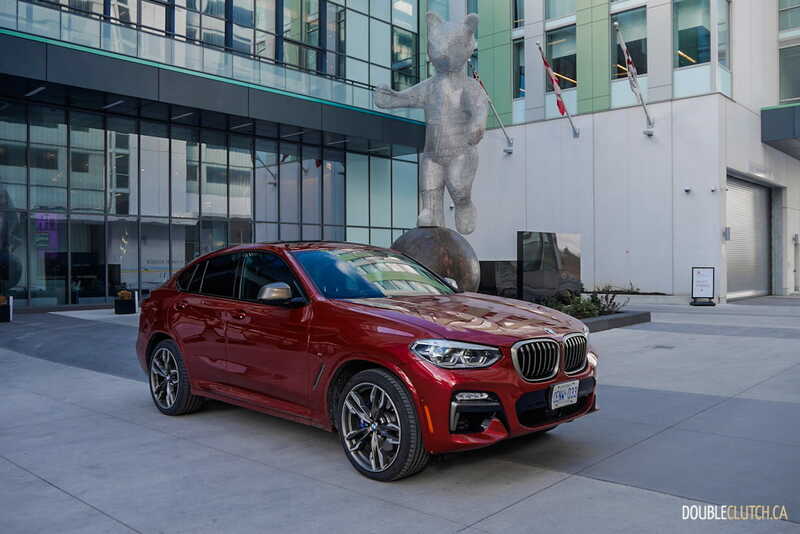 The standard Driving Assistant Package includes Blind Spot Detection, Lane Departure Warning, Daytime Pedestrian Protection, Frontal Collision Warning with City Collision Mitigation, and Rear Cross Traffic alert systems. 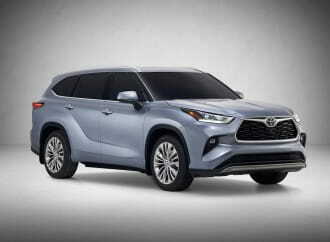 Our tester was equipped with an optional Advanced Driver Assistance Package which adds Active Cruise Control with Stop & Go, Active Lane Keeping Assistant with Side Collision Avoidance, and Evasion Aid & Cross Traffic alert front and rear systems. 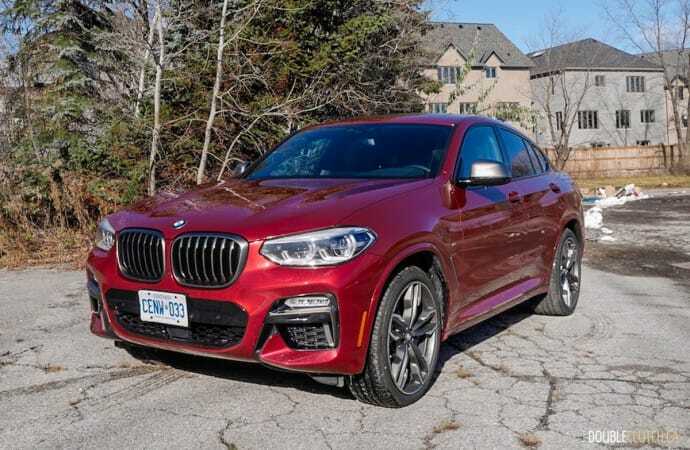 Pricing of the 2019 BMW X4 M40i starts at $66,000, a significant upcharge of $13,000 over the xDrive30i (reviewed here). 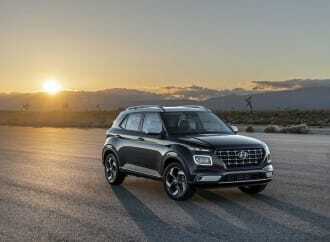 The extra options and packages on our tester brought the total to $77,145. 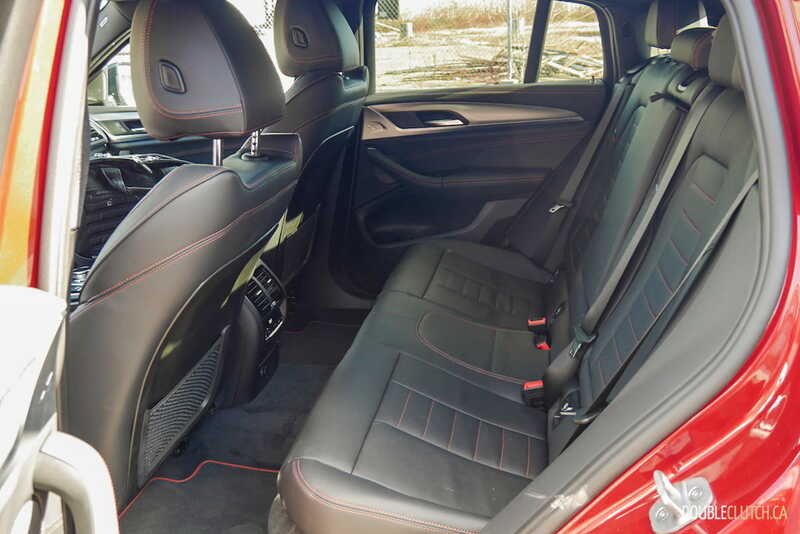 The price might seem like a lot at first but the personality of the X4 and premium interior come together to make it seem reasonable. 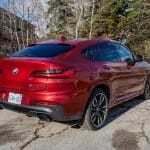 Its closest competitor, the Mercedes-Benz AMG GLC 43 4MATIC Coupe, starts at $64,500, and it can easily cost over $80,000 when equipped similarly. 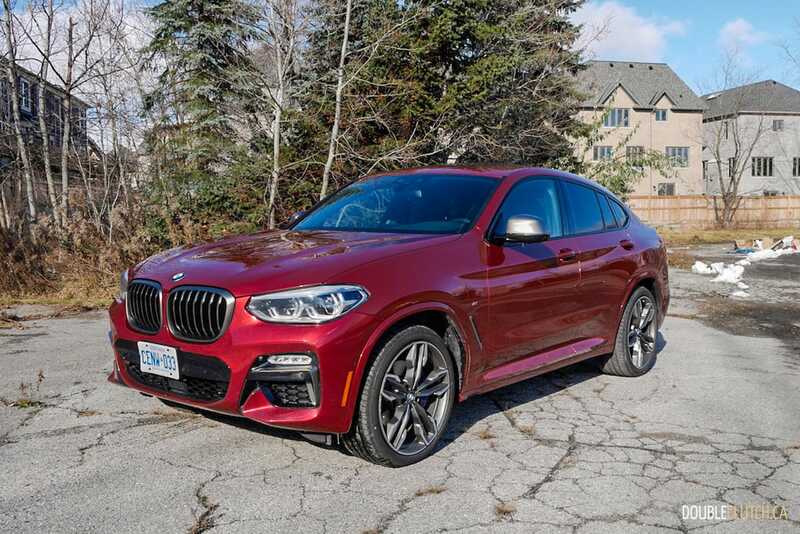 The 2019 BMW X4 M40i xDrive is a brilliant everyday performance car, wrapped in an all-weather body with controversial styling. 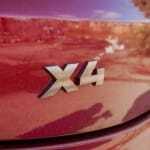 It is often mentioned that controversy is the best way to advertise, and the X4 is certainly embracing the attention it garners. 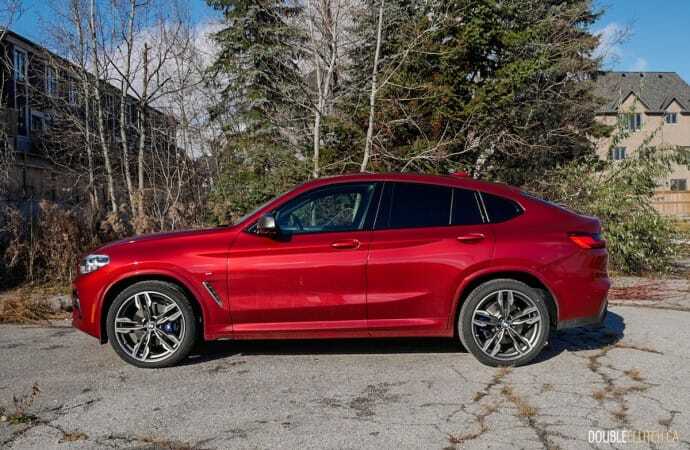 One thing for sure is that the performance and driving dynamics are universally acclaimed, and I expect the X4 M40i to make many shopping for a sporty crossover look its way.